Children nowadays were luckily provided technological entertainment. It sure had a lot of advantages, but has its own downside too, agree?. In our case, our 7-year old son was totally addicted to "MineCraft", it's a world of creating wonderful and imaginative thing using blocks (atleast my simplest description). Although we only allow him to play during weekends, he was sooo addicted in that game that he even draw his "block plans" in his notebook during school days. And, was so excited for Saturdays and Sundays to come. He's having so much fun with the game that he find doing school works as "B-O-R-I-N-G!" and he seems not interested to learn. We tried to control his 'game time', but what we failed to control was his attitude towards his priorities. 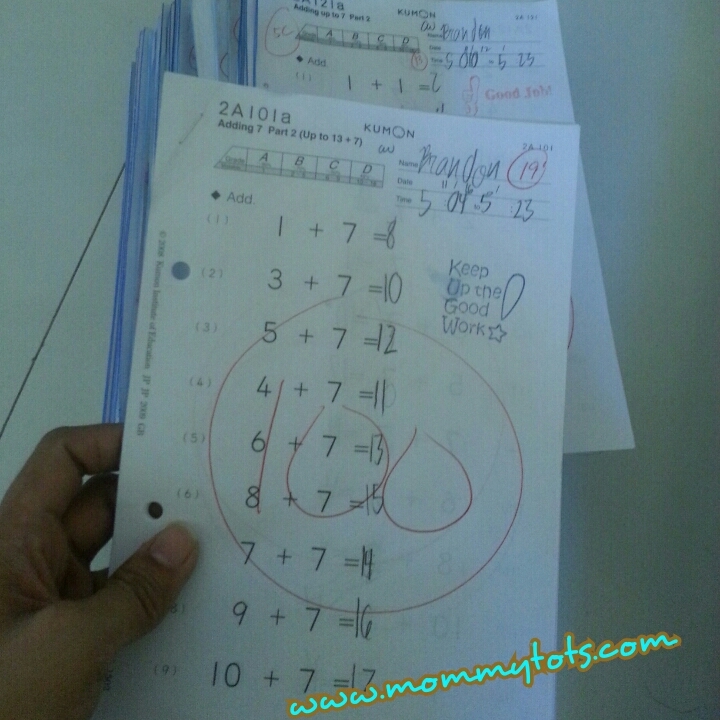 That's when I decided to provide him an after school activity, and be in Kumon Method of Learning. Yes, I ... husband was against it! Our Kumon Journey has started! I've been hearing positive remarks about this program like a daughter of a friend who got a "Best in Reading Award" at school because she improved a lot with the help of the Reading Program. I also heard some negative comment like: "bibigyan lang ng sasagutan", "paulit-ulit lang". I believe every parent needs to know and identify their child's learning style. And this 'paulit-ulit lang' is the method which I know will help my child memorized and be familiarized with number problems. So, after the 2-week Free Trial last September, we enrolled my eldest with the goal to achieve advancement in Math. One time enrollment fee is P500 and we have to pay 1 month tuition deposit and pay 1 month tuition in advance. That's a total of P4,100 cash out. P1,950 for grade seven / first high school or older students, inclusive of 12% VAT. Enrollment fee is paid per student.Tuition fee is paid per subject per student. Tuition fee is due in advance and must be paid on or before the 25th of the previous month. A monthly tuition fee envelope will be given before the due date. We have the option to pay in check or deposit the payment. The two-week free trial campaign last September was a good start for us to determine whether we can promptly attend a one-hour class, twice a week. I have to free my schedule on our 'Kumon days' and add up extra time monitoring his worksheets. That's an extra work for us, but we consider this as extra effort for the sake of establishing a good study habit and prepare my son for more difficult task. Afterall, teaching good habits should start at an early age, right? The starting point for each student is determined individually. They let him start on easy level for him to appreciate having a perfect score doing on his own. What is the reason for easy starting point? "For students to enjoy their study and improve their concentration ability, work skills and good study habits first. Students will also gain confidence and motivation by getting perfect scores many times. If students continue to study at their own pace, at a level that is appropriate to their ability, they will catch up with their school grade level and eventually advance far beyond it." In the beginning, it is OK for students to use their fingers when counting! Even if your child is using his/her fingers for addition/ subtraction, please do not force them to stop. Students will naturally stop using their fingers for counting after sufficient practice. During the free trial, I noticed that my son no longer use his fingers when counting. It was a small achievement that makes me sold even more to the Math Program. He is enrolled for almost 2 months now, he is doing good at first, and proud of his achievement. But as he reached for higher numbers in addition, he started to complain saying it's difficult to complete the 10-page worksheet and not happy to see me erase every wrong answer. 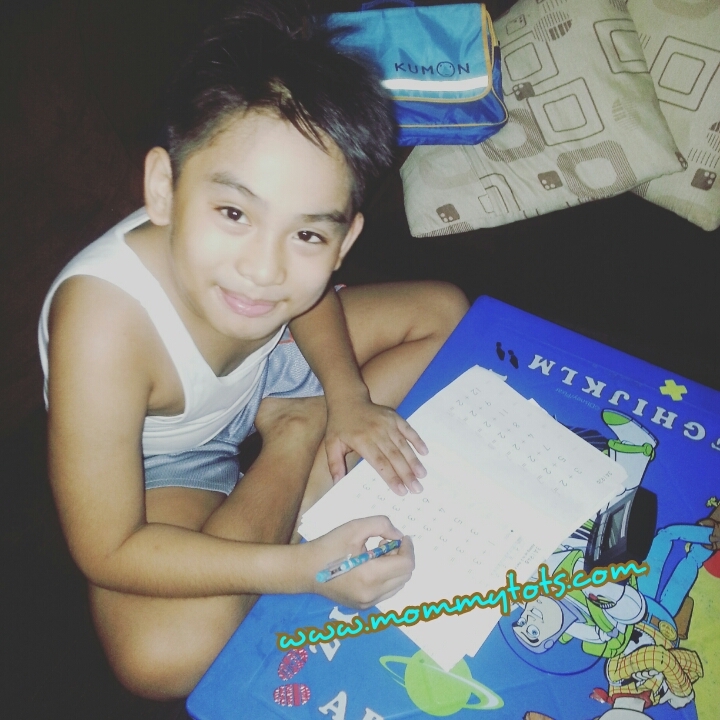 Everyday, he has worksheet to complete, and everyday, I have to boost his confidence to continue with his work and be more dedicated with our goal to make solving Math problems an "easy-peasy" task. Discuss with the instructor any difficulty of the child. Check contents of Kumon bag. That all equals to hardwork and dedication... It wasn't all the time easy, sometimes we make an adjustment on what time he should be doing his homework plus the worksheets. When we took a vacation, I brought his Kumon bag with us, but ended up not completing all of them. Frustrations and 'pilitan' comes our way, but I am truly decided to continue atleast for years to come and foresees that we can abundantly reap something through patience and perseverance. I constantly remind myself that this is leading us to good results and will teach my son to be more confident and independent learner. Overall, I highly recommend being in Kumon learning method and be prepare for challenges and lessons to be learned during the program. If you are interested, call to set an appointment for orientation and attend a FREE diagnostic test and consultation session with the instructor to know how your child's ability will be developed through Kumon. or click here to search for a Kumon Center near you. 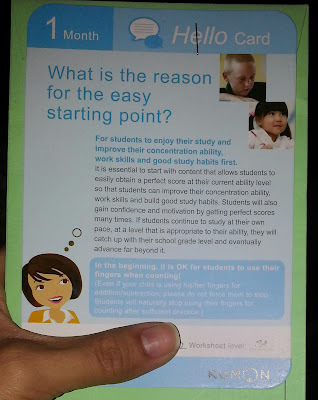 We tried Kumon Free Trial last year but we did not finish the trial because my son did not like it. He finds it boring because we started in "find the number, encircle this number". They already finished the spelling of one to 100 in school so tinamad siya. So it really depends on kids. Yeah, it depends on every child's learning style. We love Kumon too. My daughter's school actually do not recommend Kumon because of the method they're teaching the students but we stuck to it and we're happy about it. Not only it provides math skills but fosters good study habits as well. That's mainly the reason why I enrolled my child. I want him to establish good study habits, so I won't be having any problem teaching him what to prioritized as he gets older. I want him to be an independent learner and aim for excellence. We tried the free trial but I was not at all impressed with the way they handled my son. He is not as sociable as other kids and he's shy. On the first day of going there he wasn't as interactive as the teacher wanted him to be and so after 30 minutes she told me he didn't want to talk to her and that he should go home. It was very discouraging. I didn't know if it was because he it was just a free trial so no effort was made or what. I was seriously contemplating enrolling him after the trial to prepare him for school but with that experience? You can see why I changed my mind. Oh, so sorry to hear how it turns out. The instructor should be more aware of the child's needs and should know what to do as Kumon implies that they provide individualized learning method. I would love to try Kumon when my son's a little older. Hopefully we get to experience this too. You should! It is best to take advantage on their Free Trial class to help you decide if it suits your child's needs and can maximize your child's learning ability. My nephews are both enrolled in Kumon for Math. Because of that, they're always joining and winning Math olympiads. My husband keeps reminding me to let our kids try it too. Wow, that's very inspiring! Who wouldn't want to have results like that?! I will definitely keep this in mind. As a mother we will do everything to enhance our child's development. Thanks for sharing! 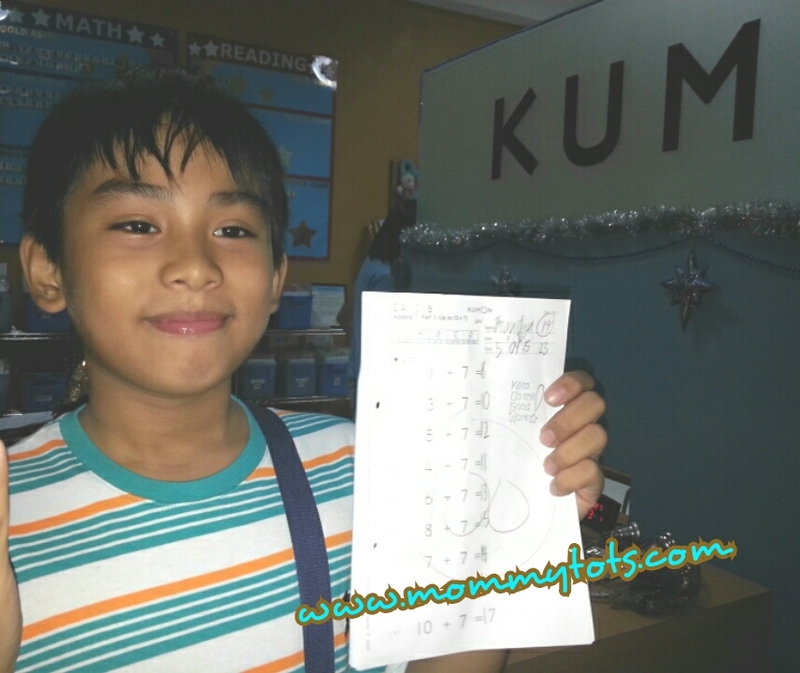 I believe in the positive results that Kumon brings! You know, I used to work as an assistant teacher for Kumon when I was in college and I really saw my students for both Math and Reading improving gradually but surely. My nieces attend Kumon and they have success stories to share. I think beyond numbers, the routine teaches discipline. We attended the diagnostic/assessment last year because we are contemplating on having our eldest son enrolled. However, my youngest son had an accident in their premises that traumatized me, that was the first and the last visit. Yey! I'm happy for you that you were able to enroll your son in Kumon. Same plan for my son but I haven't pursue it yet. Hopefully next year before going back-to-school. My daughter didn't like Kumon as she finds it boring. I guess it's different with each kid. Agree... learning to identify the child's learning style will surely improve their skills. Yes, we need to identify our child's learning style to know how to handle their needs. We wanted to enroll our eldest in Kumon when he was 5, but we didn't have budget for it. Right now we're on Saxon method and it's been doing him good.